As the days get longer, those golden rays beam down and flower buds turn to full blooms; there’s no mistaking that spring has arrived. Before the summer rush and after the short winter days comes one of the best times of the year to travel New Zealand. Here are the best things about backpacking New Zealand in spring. While spring turns the temperature dial up, the weather can still be unpredictable - packing for ‘four seasons in one day’ (basically classic NZ weather) is the safest approach. A country that doesn’t lack rain or rivers, combine this with melting spring snow for forests and fields that are even lusher in spring, and waterfalls that bit more spectacular. Arriving a month or two before summer means that you’ll get to enjoy some of our most scenic spots with minimal selfie-stick types cutting your view. It’s the best way to get up-close and personal with Aotearoa (New Zealand in Maori) and spring is perfect for limbering up those hiking legs. Sunny spring days and lack of crowds mean you’ve got some of our most epic hikes to yourself. Local lingo tip - us Kiwis usually refer to hiking as ‘tramping’. There are nine of New Zealand’s best multi-day hikes, with three in the North Island and the other six in the South Island. The huts along the routes often book out months ahead during summer, but in spring you’ll find booking a spot to sleep much easier, with more moments where you’ve got the breathtaking views completely to yourself. The coastal or lower altitude walks are your best bet in spring. Higher tracks stay snow-covered (and avalanche prone) until the start of summer. The Abel Tasman Coastal Track is our top pick: the most popular multi-day walk, it’s got well-marked paths and easy enough for any fitness-level to tackle. It also happens to be in New Zealand’s sunniest region with a stunning coastline and plethora of golden sand beaches. Nature lovers take note – spring is the best time to appreciate our diverse flora and fauna. The high rainfall across winter and many hours of spring sunshine combine to bring you breath-taking views. Lambs bounce around the fields, flowers and fruit trees bloom and New Zealanders and travellers alike start to take advantage of the balmy twilight evenings. Spring is most definitely lamb season! Lush green fields all over the country start to fill with these adorable, slightly clumsy creatures. Spot them (attempting) to leap about on their skinny little legs and generally just looking very cute and fluffy. From daffodils popping out everywhere to the stunning cherry tree blossoms, New Zealand in spring is overflowing with insta-ready prettiness. It’s a short but stunning period, get here in mid-September to enjoy maximum flower power. The lupins only bloom for 4-5 weeks and are best in late November. A little later on in spring our favourite fruity time of year kicks off with deliciously sweet strawberries, cherries, apricots and plenty more juicy goodness coming into the season. Spring is your last chance to check out our awesome ski fields and get in some spring skiing. Blue skies, mild temperatures and decent snow cover make for awesome days on slopes. Depending on snow cover the slopes usually stay open until late September, though if it’s a cracker of a season this can even stretch until October! Day Light Savings means longer days and more hours to get out there and get amongst the slopes while the warmer days make it all the more enjoyable. Arrive before the summer rush hits Aotearoa and you’ll get summery benefits such as longer days and warmer weather with the tranquillity of spring travel. Most people, including locals, travel New Zealand in the height of summer. Spring comes equipped with warm weather, long sunny days and fewer people around. Which means fewer queues, more space and more flexibility for you to enjoy your trip of a lifetime. Want to catch it all while it’s still in bloom? Spring into an adventure with our Mighty Moa pass. 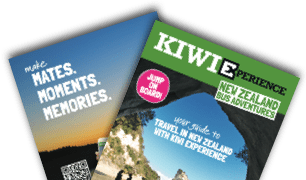 Designed to make the most of spring or winter in New Zealand for an extra low price, you just need to start travelling before 31 December to use the pass. The Mighty Moa lets you start and finish your trip anywhere on our route, ideal for a little extra time to enjoy the sweet spring flowers and snowy-peaked Southern Alps!